A trend favoring value, and defensives, over growth accelerated Wednesday in the worst market day since February. Strategists credit the trend on rising interest rates, as the 10-year Treasury note yield this past week reached a high of 3.26 percent. The Dow was down 831 points, or 3.1 percent, as investors also sold off more cyclical names like Caterpillar and Boeing. 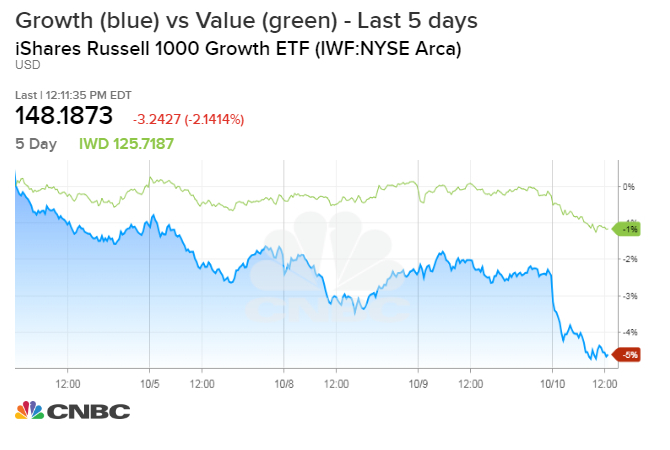 Investors dumped technology and other growth stock winners Wednesday in favor of defensive and value names, a trend that has accelerated as interest rates rise. Tech stocks fell 4.8 percent in the worst day for the S&P sector since Aug. 18, 2011. The tech-heavy Nasdaq led the declines with a 4.1 percent loss, and the Dow ended down 831 points or 3.1 percent. The S&P 500 was off 3.3 percent, but the small-cap Russell 2000, however, was down slightly less at 2.8 percent. "We've had a rolling correction. It started with the small caps over the last couple months, and now they're getting to the mega caps. The correction sort of rolled, and now we're finally getting to the big boys," said Peter Boockvar, chief investment officer at Bleakley Advisory Group. But the sell-off has definitely been targeting big-cap growth names, like "FANG" companies Facebook, Netflix, Amazon and Google's parent Alphabet, all down sharply. In tech, semiconductors were down 3.4 percent, and have now fallen more than 7 percent since the start of October. Names tied to global growth, like Caterpillar, have also been slammed. But telecommunications stocks and utilities, traditional defensive sectors, were higher. Some steady consumer products stocks were also in the green Wednesday and for the month. Some discretionary stocks, like Dollar Tree and Kohl's were higher, and mining stocks, including Newmont Mining also made gains. The S&P 500 is off by 3.9 percent so far in October. As of Wednesday morning, the Russell 1000 Growth Index was down by double that in October. Meanwhile the Russell 1000 Value Index is off by less than 1 percent for the one month. "That's clearly a trend that's at play in the market. There's a lot of fundamental reasons why people might be making that shift, and rates is one of them. You're also just coming into a new quarter, and earnings season is just around the corner," said Robert Sluymer, technical strategist at Fundstrat. He said earnings season could provide the catalyst to reverse the sell-off. Sluymer tracked the growth stocks in the Russell 1000, compared with value names in the index. "It has broken the uptrend that was in place since 2017. That could be one trigger for people taking profits but it has not yet broken the August lows," he said early Wednesday. "The long-term relationship between rates moving down and growth outperforming has been in place since the early 1980s," said Sluymer. Mike Wilson, Morgan Stanley's chief U.S. equities strategist, said earlier this week that he expects the interest rate-triggered rotation to continue and that it is a break with a decadelong trendof growth winning over value. "We think this creates a tipping point that explains many of the performance themes this week and lays the groundwork for something of a regime change that is very much in line with our overall outlook for the S&P 500, as well as our style and sector recommendations," Wilson wrote in a note. Wilson has said he believes stocks are already in a bear market. But other strategists see the sell-off as more of a temporary event. "We think that October is going to be more volatile and people just really got lulled into a false sense of complacency because the September didn't have its usual volatility," said Julian Emanuel, head of equity and derivatives strategy at BTIG. "We are on record saying what could potentially happen is, in the years after midterms, that the following two months after midterms and the following year have above-average returns." Todd Sohn, technical strategist at Strategas, said the type of selling in tech is not surprising for October. "You do see this historically. 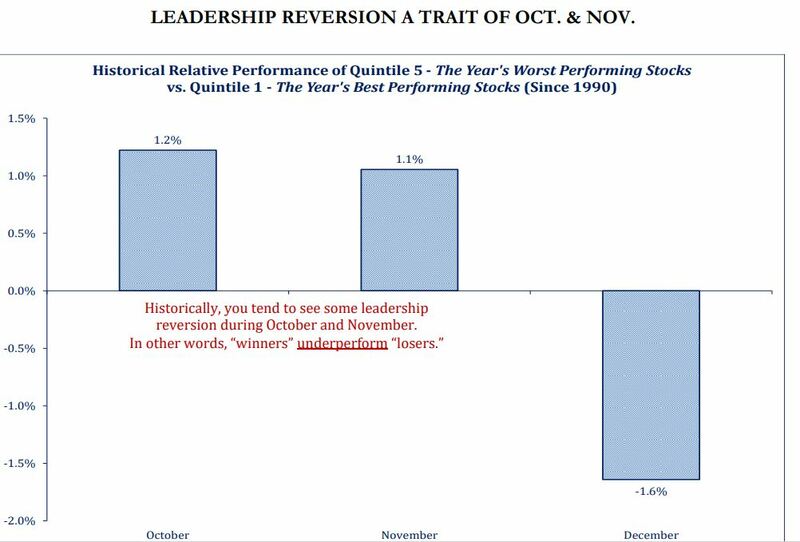 October tends to be a month when winners outperform losers," Sohn said.